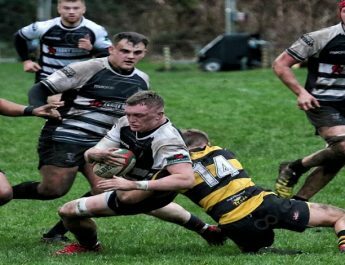 Cross Keys started the 2018-19 Principality Premiership season with a bonus point victory over Bridgend Ravens at Pandy Park last Saturday after an enthralling, breathless clash. The Keys got off to a good start when after securing possession from their own throw toward the Ravens 22, one of Keys star summer signings Jason Tovey made an excellent break in to the 22 before off-loading perfectly to Nic Cudd, who appeared on permit from the Dragons in the Keys side and the flanker did the rest to cross under the posts at the clubhouse end, for Keys’ first points of the definitive 18/19 campaign. Tovey added the extras with a little under 10 minutes played. The Ravens got themselves back in to the game just moments later when some poor Keys defence allowed the visitors to build good field position and from a Ravens scrum the visitors worked the ball out wide where their skipper Nathan Edwards managed to squeeze through and touchdown in the corner for his side’s first points of the game and the season. Jamie Murphy failed to add the extras with the conversion from the touchline. The Ravens remained in control with Keys struggling for possession and it was no shock when the visitors took a one point thanks to a Jamie Murphy penalty midway through the first half. The Ravens winger Will Holley did attempt 2 long range penalties as the first half went on but could not combine both accuracy and length with either kick as one drifted wide whilst the other fell short despite direction being good. Keys reclaimed the lead with around 25 minutes on the clock when Jason Tovey slotted over a penalty from the 22. The Keys quickly made their way back up field from the restart and with around half an hour played they managed to exploit some space out wide and centre Jarryd Sage almost made it to the line for Keys’ 2nd try of the day but he couldn’t quite find the space to cross but he had number 8 Todd James, a summer signing from Risca on his outside and despite a juggle as he crossed the line he kept control to crash over in the corner for a well worked try which Tovey converted from the touchline to give Keys a clear cushion with half time approaching. The Keys lead was extended with around 2 minutes of the half remaining when Tovey added his second penalty of the day with a penalty from in front of the posts some 30 metres from goal. 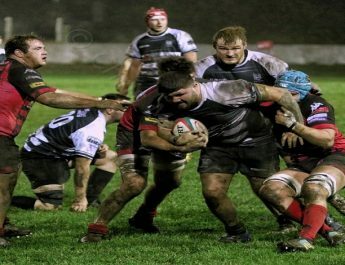 It was Keys that started the second half brightly and some good interplay between full back Leon Andrews and former Bedwas wing Rory Budina saw Keys move deep in to the Ravens 22. Andrews was on hand to finish off the fine move to touch down for Keys 3rd try with 7 minutes of the second half played. Jason Tovey failed to add the extras from the right hand side of the posts. 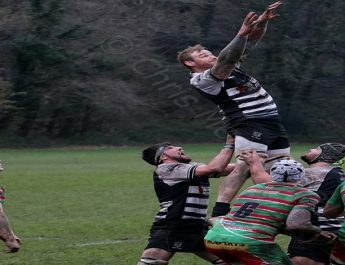 As time went on the Ravens tails were lifting and they looked to have closed the gap with around 53 minutes played when lively winger Aaron Grabham looked to have got his side’s second try of the day only for it to be ruled out for a forward pass after the referee had consulted with one of his assistants. This setback didn’t deter the Ravens and they continued to have the upper hand with Keys making some basic errors and missing one too many one on one tackles. Grabham was not going to be denied from his second opportunity as he was on hand out wide after Keys failed to deal with a loose ball around the halfway and the Ravens had plenty of options before the ball was worked out to Grabham who crossed for an unconverted try just shy of the hour mark to ensure a tense closing quarter. The Ravens bought themselves firmly back in to things almost immediately from the restart when some weak Keys defence this time allowed the visitors to break up field and a neat grubber kick through by Murphy was gathered and the ball was worked out wide to Grabham once more and the winger crossed for his second try of the game with around 62 minutes played. His fellow winger Will Holley took over the kicking duties and was successful with his touchline attempt to further close the gap. There appeared to be a collective sigh of relief from Keys with around 10 minutes remaining when after finally having some meaningful possession they were able to break in to the Ravens 22 thanks to good work from Lee Evans, captain Damien Welch and Nic Cudd put them on the front foot and Cudd was able to deliver a scoring pass to Wes Cunliffe and the powerful winger burst through to crash over for Keys’ bonus point try which Tovey calmly converted. With the game in added time there was time for the Ravens to claim a 4 try bonus point of their own when they squeezed over in the score board corner, thanks to a good break from Will Holley who found second row Chris John in support to cross for the try which also secured the losing bonus point for the Ravens despite the missed conversion. Overall with such a new look to this Keys outfit under new skipper Damien Welch, there might be one or two in Welsh rugby who don’t fancy Keys to do much this season but the squad certainly looks good enough to compete and the attitude is looking really good amongst the squad who look to have bonded superbly over the summer and this Keys squad might just make those one or two doubters sit up and take notice as the season goes on and the new look Keys squad gets more acquainted with each other. There can be no doubt that Jason Tovey and Damien Welch will be crucial to Keys’ chances over the season but the likes of stalwarts Richard Cornock, Tom Lampard and Leon Andrews will also prove to be vital to Keys this year as they have been for the years gone by. Combine those individuals with some shrewd recruitment with the likes of Wes Cunliffe, Lee Evans and Rory Budina coming on board to add a wealth of Premiership experience with younger squad members in the shape of Rhydian Jenkins, Harvey Reader and Declan Williams and Keys have the makings of a solid squad that potentially can raise an eyebrow or 2 as the season goes on.